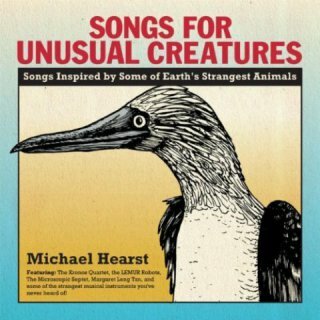 Michael Hearst, better known as the theremin player of unique band One Ring Zero, has released Unusual Creatures, an album celebrating his love for both bizarre animals and unique instruments. The album includes sixteen tracks, each devoted to a different animal and features special guests such as the musical robot band, LEMURbots. Hearst hopes his album draws attention to his favorite strange instruments such as the glockenspiel, the tubax, and the contrabassoon, as well as his favorite animal oddities including the blobfish, the tardigrade, and the bilby. In addition to the album, which comes with fully illustrated liner notes, Hearst is working with artist Jelmer Noordeman to produce a matching book profiling each animal due out in October. The book answers pressing questions animal-lovers have including: Which animal poops cubes? and Which animal can disguise itself as a giant crab? While you wait to find out the answers to those questions, check out this vieo of Michael and LEMURbots playing "Horned Puffin." Yu can download Songs for Unusual Creatures with this link. His prior work, Songs for Ice Cream is also available for dowload. Why are People Laughing? The "If There Wasn't Glass There, It Would be Chaos" Animal Video of the Day!! !